Nothing is an uninhabited ghost town in eastern Mohave County, Arizona, United States. The locals told travelers it "got named by a bunch of drunks." Nothing has frequently been noted on lists of unusual place names. 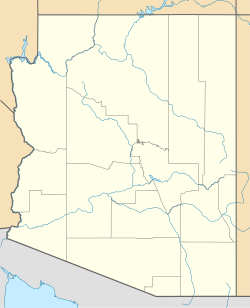 The settlement was established in 1977 by Richard "Buddy" Kenworthy, located 100 miles (160 km) northwest of Phoenix, Arizona, and roughly 20 miles (32 km) south of Wikieup, the "rattlesnake capital of Arizona." It is west of Bagdad at milepost 148½ on U.S. Route 93 (the Joshua Forest Scenic Parkway) between Wickenburg and Kingman, on the route from Las Vegas to Phoenix. The Arizona Department of Transportation (ADOT) installed one of four motorist call boxes on U.S. 93 at Nothing. “ Town of Nothing Arizona. Founded 1977. Elevation 3269ft. At its height, Nothing had a population of 4. The settlement contained a gas station and small convenience store. As of April 2011, it appears that Nothing has once again been abandoned. The building has fresh boards in the windows, and no sign of inhabitance or any activity. In 2016, Century 21 real estate ran a "Give Dad Nothing" promotion where a free 24 hour lease to a piece of property at Nothing, Arizona could be secured for June 19, 2016 (Father's Day) only. The promotion was done with the participation of the current property owner and included a downloadable "Certificate of Nothing" and gift card. ^ a b c "Nothing (historical)". Geographic Names Information System. United States Geological Survey. ^ Peterson, Dale (2001). Storyville, Usa. Athens: University of Georgia Press. p. 238. ISBN 0-8203-2303-9. ^ Parker, Quentin (2010). Welcome to Horneytown, North Carolina, Population: 15: An insider's guide to 201 of the world's weirdest and wildest places. Adams Media. pp. xi. ^ Thompson, George E. (1 July 2009). You Live Where? : Interesting and Unusual Facts about where We Live. iUniverse. p. 5. ISBN 978-1-4401-3421-0. ^ Will Shiers (6 November 2010). Roadside Relics: America's Abandoned Automobiles. MBI Publishing Company. p. 64. ISBN 978-1-61060-114-6. ^ Ruelas, Richard (29 April 2009). "Pizza chef has high hopes for his roadside attraction". The Arizona Republic. Gannett. Retrieved 2009-04-30. ^ Cave, James (13 June 2016). "You Can Literally Give Dad 'Nothing' For Father's Day". The Huffington Post. The Huffington Post. Retrieved 2016-06-19. ^ Peters, Terry (8 June 2016). "Real estate company offers the chance to give Dad 'Nothing' this Father's Day". Today. NBC News. Retrieved 2016-06-19.